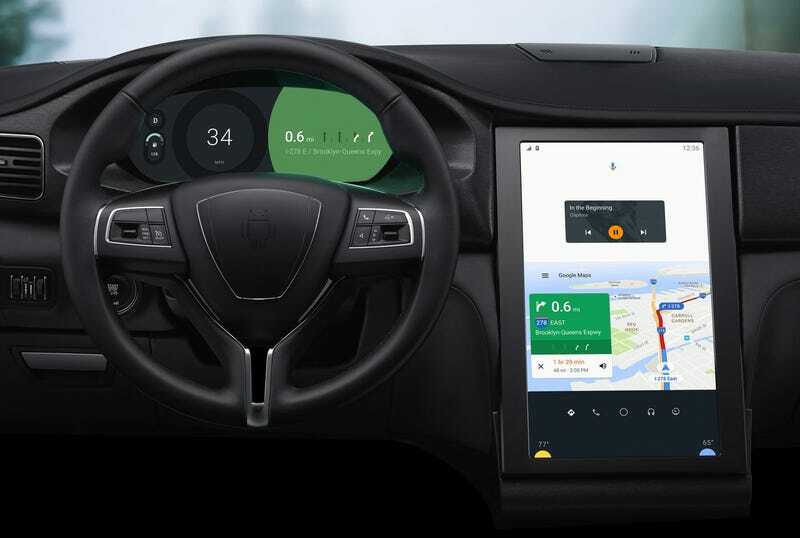 Google announced a huge wave of updates with practical new features and plans for its Android Auto car interface system, including the ultimate dystopian future-reality fear of your phone completely encompassing your car. That last part actually isn’t that bad. At today’s Google I/O conference, Android Auto got a few big updates as well as a chance to preview the future of the automotive interface in the form of a Qualcomm-modified Maserati Ghibli. The modified Maserati included a new vertical-layout 4K screen, pictured above like you’d find in Tesla’s offerings, with a digital readout running a specialized interface model called Android Auto N. Also synced up to the Android phone was an HD instrument panel screen, displaying instructions alongside speed directly in front of the driver. The benefits of a more-integrated interface like this opens the doors to vehicle controls like temperature and technical readouts like speed, gas mileage, fuel levels, etc. The best part is that the Qualcomm system would be open-source, so if you wanted to boot up Apple CarPlay instead (and it had the functionality for it) you’d be able to. Now, that’s the future. The present updates and new features for Android Auto honestly have me finally sold on the feature. Before you had to own an Android Auto compatible car to plug your phone into and use the interface, but the updates fix that. First up, you can now use Android Auto without actually connecting it to the car’s interface. Many people were surprised to learn that they couldn’t run Android Auto’s simpler interface design while driving just using the phone. Why not making the benefits of a minimal-interaction interface available at all times? Well now it is! The second major update is wireless connectivity for Android Auto. The current system requires the phone to be physically plugged into the car, taking up that coveted charging port. Later this year Android Auto users should be able to connect to the car’s interface via WiFi, as long as your car offers a hotspot to connect to. The final minor tweaks for Android Auto to come later this year include two more things: the “OK Google” voice command prompt will finally be available to interact with Android Auto’s interface like you would other Google or Android products; and the Waze navigation app will finally be available to use instead of Google Maps later this year in the Android Auto interface. A safer way to boost your score? So, now that you can use Android Auto just running on your phone, without giving up your favorite game-ified navigation app, are you willing to try out Android Auto?